I saw this original Eames Lounge and Ottoman in an antique store on my last trip to Brussels in November, a trip that coincided with the dollar's slide to an all-time low against the euro. The piece was in perfect condition, the chocolate brown leather worn-in just gently enough to be as soft as butter. I was smitten but the euro/dollar exchange rate was so bad it would have cost at least $3000 to have it delivered to me, with no guarantee it wouldn't be damaged in transit. Reluctantly, after briefly considering dreaming about buying a pied-à-terre in the city and placing this iconic furniture in it, I let go and walked away. 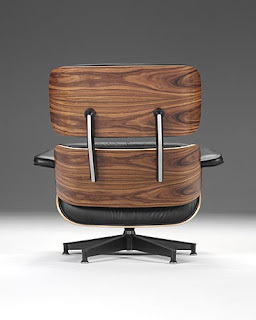 Then, in the bon chic bon genre Sablon district, we saw a brand new genuine Herman Miller licensed version in cherry and black leather for ::gulp:: 4900 euros, approximately $7000. Now, the same basic 670 and 671 models in the US were selling for $3899. If you subtract the price of the chair in the USA from one sold in Europe you save over $3000 or almost the price of the American Lounge Chair and Ottoman. It would be like BOGO - nearly free! Right? ...No? Well, that's the justification I made when I gave in and ordered the limited edition Santos Palisander ( a sustainable alternative to the original rosewood veneer) Chair and Ottoman with black Dream Cow leather. It's an upgrade but I took advantage of free shipping and an extra 20% off promotion in December. It was a huge splurge, I know, and if I hadn't compared the prices in euros and dollars I would almost certainly never have taken the leap but if you remember I said back in 2004 I wanted one fine mid-century chair to complete the house; it's just that turned out not to be a Pierre Paulin Ribbon Chair but an American classic. Congratulations!!! I'm so excited for you. 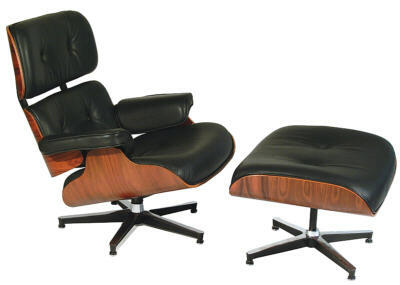 And in my book, there is never a need to justify an Eames! I can't wait to see it in place! Great decision on the chair. Very nice. I am starting to save the airfare right now so I can come and test it out - looks divine! Some people have their signature luggage, car, etc. You have this fine chair. I have chair envy. Good for you!